Angela was drawn to the Arts at a very young age. From childhood into college Angela focused on dancing and received a bachelors in performing Arts and danced professionally. She fell in love with Sugar Art in 2000 finding her calling. Angela has studied with some of the best cake artists in the country, one of whom is Colette Peters; owner of Colette’s cakes in New York City, Colette is often seen on the food network and has several publications. Angela has appeared on The Oprah Winfrey Show as a guest judge and competes in competitions around the country. Sandra is Maribelle’s Lead baker and has been with Maribelle over 19 years. She has an amazing laugh that keeps joy in the Kitchen all day long. Sandra is also a beautiful decorator. Freshly out of pastry school; Mary is full of life. 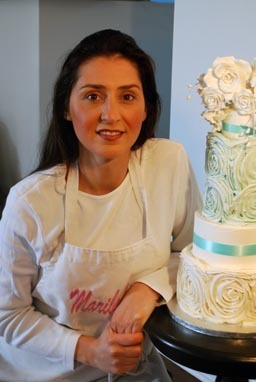 Mary is one of our young ladies in charge of cookies and pastries for Maribelle Cakery. With her little touches she makes them very special for our customers. Mary keeps all of us laughing. Liz graduated from Midwest Culinary School and is a great addition to our Bakery. She is really great with Sugar flowers. Our Kim is one of Maribelle’s shining Artists. She is so talented; we are blessed to have her. She has been working with cake art for 20 some years.